All transactions are safe and secure with a reliable history in online purchasing behind each of our associates. 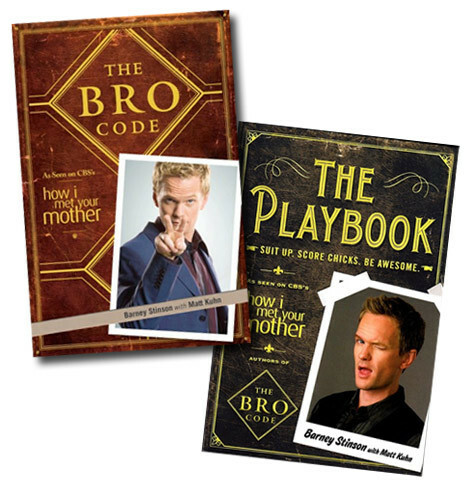 Buy The Bro Code and The Playbook Barney Stinson Books to own How I Met Your Mother clothing and merchandise. Barney Stinson lives his life by way of the Bro Code, except for when he slept with his best friend Ted Mosby's ex-girlfriend Robin, but we're willing to give him a pass for that one since it may be true love. Now you can get your hands his coveted and humorous guide to being a bro. If you're also looking to master his techniques for picking up women, then grab a copy of The Playbook, which includes over seventy-five tips for scoring chicks. In addition to The Bro Code and The Playbook Barney Stinson Books above, browse the How I Met Your Mother Clothing Gallery for more apparel like men's and women's clothes, kids shirts or hoodies.